... that Incapillo (pictured) is the highest explosive caldera in the world and may still be hydrothermally active? ... that Kenneth Rayment, the co-pilot during the Munich air disaster, was a decorated World War II flying ace? ... that Icebar Orlando is claimed to be the world's largest permanent ice bar? ... that Political Animals and Animal Politics was the first edited collection focused on the political turn in animal ethics? ... that the narrowtail catshark is thought to be a pedomorphic dwarf? ... that Mexican federal deputy Fidel Kuri Grajales threatened to move the Tiburones Rojos de Veracruz if the Institutional Revolutionary Party lost the gubernatorial elections? ... that the July 7 opening date for the Ark Encounter theme park was chosen to correspond with Genesis 7:7? An armed attack at Istanbul Atatürk Airport leaves at least 41 people dead and 230 others injured. Flash flooding in West Virginia kills at least 23 people. After the United Kingdom votes to leave the European Union, British Prime Minister David Cameron (pictured) announces he will resign by October. A tornado kills at least 98 people and injures approximately 800 others in Jiangsu Province, China. In basketball, the Cleveland Cavaliers defeat the Golden State Warriors to win the NBA Finals. 1659 – Russo-Polish War: The hetman of Ukraine Ivan Vyhovsky and his allies defeated the armies of Russian Tsardom led by Aleksey Trubetskoy at the Battle of Konotop in the present-day Sumy Oblast of Ukraine. 1864 – Canada's worst railway accident took place when a passenger train fell through an open swing bridge into the Richelieu River near present-day Mont-Saint-Hilaire, Quebec. 1974 – Isabel Perón (pictured) was sworn in as the first female President of Argentina, replacing her ill husband Juan Perón, who died two days later. 2006 – The US Supreme Court delivered its decision in Hamdan v. Rumsfeld, ruling that military commissions set up by the Bush administration to try detainees at Guantanamo Bay violated both US and international law. Hip, Hip, Hurrah! is an oil painting on canvas by the Norwegian-Danish painter Peder Severin Krøyer. 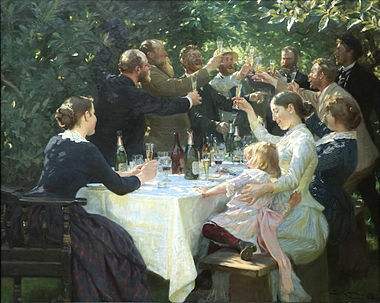 Completed between 1884 and 1888 in the style of the French Impressionists and Naturalists, it shows the Skagen Painters during a party at Michael Ancher's house. It is presently in the Gothenburg Museum of Art, having been donated by the art collector Pontus Fürstenberg. This Wikipedia is written in English. Started in 2001 (2001), it currently contains 5,184,148 articles. Many other Wikipedias are available; some of the largest are listed below. This page was last modified on 26 December 2015, at 10:03.